Wow. Did we have an exhausting (but totally awesome) tuesday night! In a spur of the moment idea, I decided that we would go to Let's Jump last night. It was a Tuesday night, so it wouldn't be too busy, and Tot has been really good lately and I thought she would enjoy going somewhere she hadn't been before. Plus, two rooms full of jump houses and jump races??? 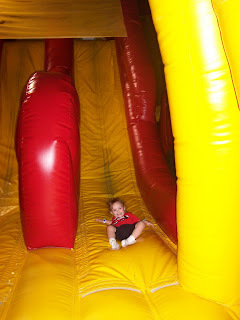 How could a kid not have fun (and totally exhaust themselves ensuring that Mom and Dad get an awesome night's sleep)? Oh yes, I thought this through. After confirming with David the plans for the evening, I remembered that Tuesday is also $1 Happy Meal night at our local McDonalds. You get a hamburger, fries and a drink for the low, low price of $1. Given my love of the Golden Arches, I decided to make a night of it and have us all eat Happy Meals and then go jump around. We left as soon as David got home and pulled into the packed McDonalds. Apparently, it was also some school night and we waited many moons to get our meals. Regardless, we got them, and we headed over to a nearby park to eat our food. It was perfect weather, and we opened all the windows and turned on the sports station and listened once again to the recap of the Cowboys Monday night insanity. The kids chowed down and we all talked and had we just done that it still would have been a great night. After we finished, we started over to the jump house place. None of us had ever been there, although all of our friends with kids Tot's age swear by it. You only pay for the kid's admission, and kids 2 and under are free - or 1 and under, not sure, either way we only had to pay for Tot and we all got to play. We walked past the double doors and saw the most giant jump houses I have ever seen in my life. I thought Tot would explode with happiness. She immediately raced off to the nearest one, with Dave running behind her and taking off his shoes and throwing them at me. I decided that Little David and I would go on one of the smaller mazes, and began to climb through the teeny tiny holes into the jump house. Not only was Little David utterly terrified (and by terrified, I mean all but clawing my skin trying to get as close to me as possible) and not making climbing the jump houses squishy stairs (made for tiny kids feet) easy at all, he was HEAVY. Seriously, by the time I had climbed two sets of squishy stairs and hurdled us over a squishy wall and smushed us through a squishy "squeeze" section, I was breathing so hard it burned and David was crying and then we slid down the enormous slide (which I thought was totally rad) and freaked the poor kid out so badly he wouldn't enter another jump house the rest of the night without clawing at my neck skin. I can not explain trying to navigate such small spaces with a 28 pound child attached to your neck squeezing so hard it hurts. The worst part is, you can't turn back. You just have to keep going. So we did. She climbed a wall just like that that was probably 10 feet tall. And she did it without a blink. She just chardged ahead laughing and telling me to hurry up. Easy for her and her tiny feet, but mama's size 9's don't work so well on 3 inch pads of fabric and air. 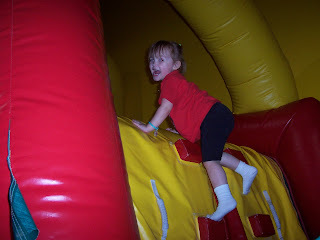 She lept over blocks, hurdled over tall walls, and climbed so many walls and tilted stairs I was amazed she was able to walk at the end of the night. But the best part of the night by far, was racing down the giant slides. We went so many times I lost count and I'm pretty sure I had just as much fun as Tot did :). We took Little David a few times and eventually he warmed up to not panicking, so we counted that a success. We jumped for about and hour and a half, and I don't remember the last time Dave and I laughed so hard or were so tired. All in all, I counted this a very successful Chapman Family Fun Night. Great food, awesome fun, and I can tell you we will SO be going back to Let's Jump again. I think, in fact, we may institute a weekly Chapman Family Fun Night, where we go do something that the kids will love and we'll all get to be active together and spend time just the four of us. So, that was our night. What do you all do for fun as a family? 1. Love the mental imgage of you hauling LD on a very movable surface. 2. On my way home today I got stuck behind a truck with a giant Texas Longhorns grill and thought of you. It took a second for it to dawn on me what it was, but I looked up as this trucked pulled out in front of me to see two really big, goofy looking eyes, a couple of ginormeous horns, and a burn orange body. Lots of giggles ensued. I love that you all have a family fun night! I must say this is a weak area of ours...so I have no ideas to recommend. Maybe you could keep posting about your outings and help inspire the rest of us. What a fun night. I can't believe how big your kids are getting. 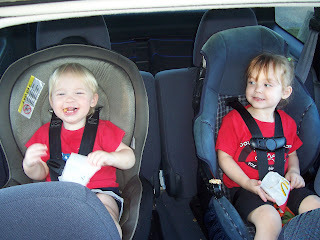 They look like two little adults sitting in the backseat! !